Twenty years into a life sentence, you could be forgiven for giving up. “I will not be leaving here — this is my home until I die,” says John. 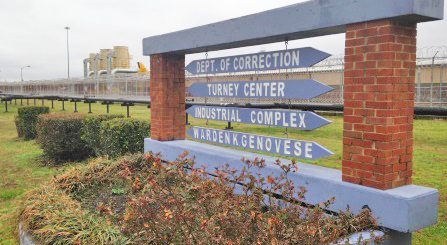 The 55-year-old prisoner speaks deliberately as he walks his golden retriever, Iggy, around the grounds of the Turney Center Industrial Complex on a bright March morning. He looks out above the barbed wire fence at a clear sky. He seems thoughtful, a little tired, and like he needs to get something off his chest. “For so many years, I was angry, angry, angry. I would bust anybody’s head in for any reason,” he says. 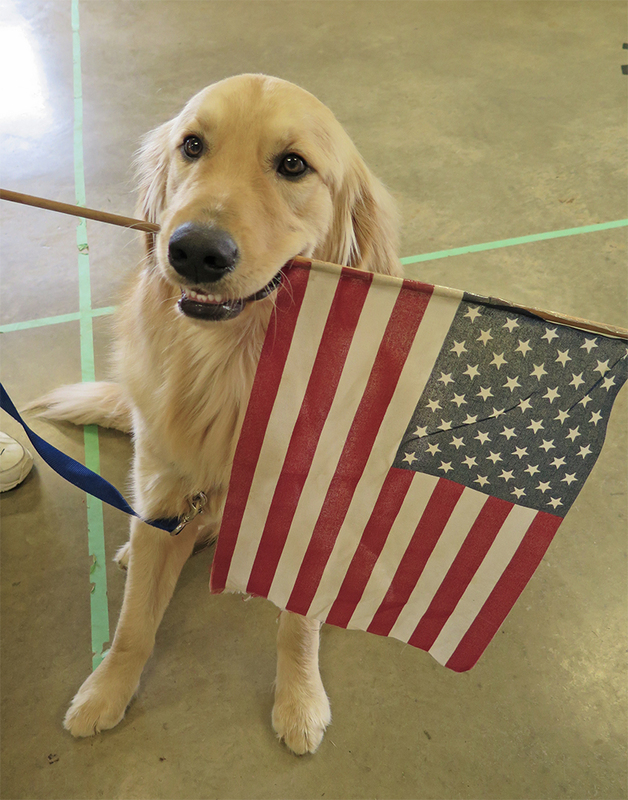 That program is Retrieving Independence (RI), a Nashville nonprofit that breeds, trains and places service dogs with people who are living with physical, mental or emotional disability. 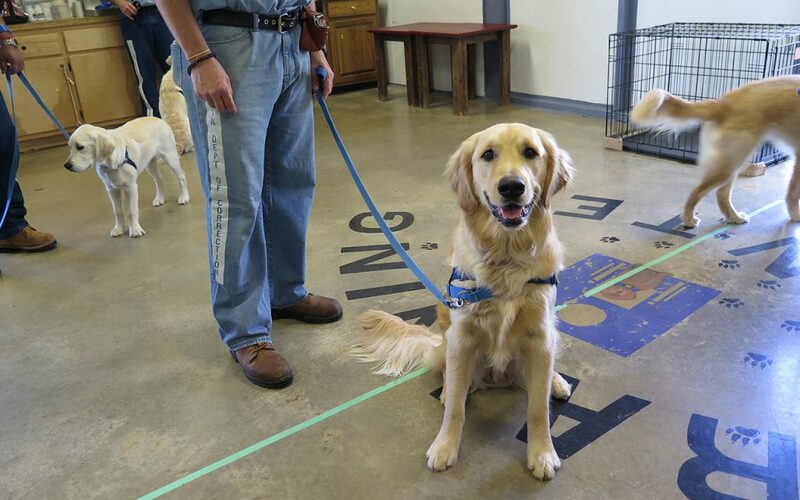 Five years ago, RI started a partnership with the Tennessee Department of Corrections to allow inmates to train the dogs. The whole process takes 1.5 to 2 years, with the dogs living with inmates during the week and leaving on the weekends for socialization. On those excursions, the dogs go everywhere from church to the grocery store to the movies, so they’re accustomed to the outside world and meeting new people from an early age. Whatever their final job ends up being, they all start here: in prison with Dr. Brenda Dew. Dew is the Counseling Coordinator for RI, and she’s here to lead 46 inmates in a training session, just as she does every Tuesday. “‘Do you get scared?’ — that’s the No. 1 question people ask me when they hear what I do,” she says smiling as she removes her shoes before going through security. “But I’ve never had a problem with any of these men. Dew follows Officer Jenkins through two cage-like checkpoints, across a field and into a building the size of a gymnasium. 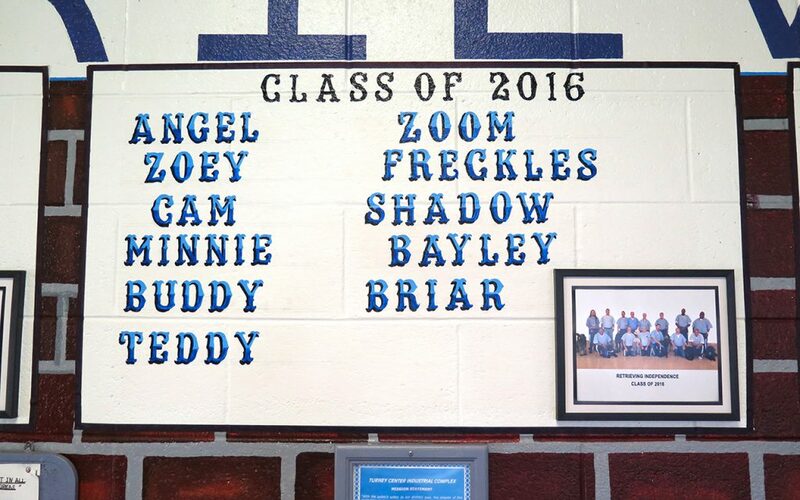 By the time they graduate, the dogs can operate all those things and more. To illustrate, Dew asks John to show us what Iggy can do. At his command, Iggy opens the refrigerator door and gets out a juice bottle; she pulls laundry out of the dryer and puts it in the clothes basket; and she hits a button to open a handicapped door and another that would ring a doorbell. But her real star turn is in the bathroom, where she turns on the light, flushes the toilet and turns the water on and off. 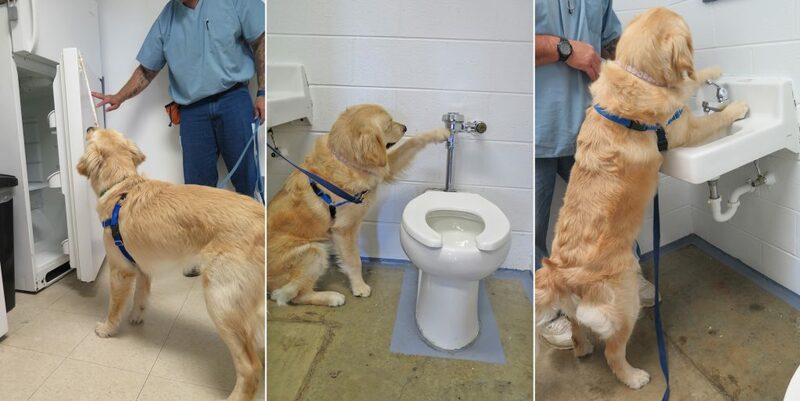 Seeing a dog do these things — and take such pride in doing them — is remarkable to watch. As Iggy snuggles back up to John’s side, he tells her what a good girl she is, and Dew smiles and nods at the progress they’ve made. It’s clear they are a team, and a capable, patient, smart team at that. “Did you know dogs have a similar brain capacity to a 2-year-old child? People think I’m crazy for saying that, but it’s been scientifically proven!” says Dew. “They can count, recognize ‘yes’ and ‘no,’ and learn up to 300 words. “We can train them to do so much. If you have trouble with mobility, we’ll get the dog a harness so they can stabilize you as you walk. If you’re diabetic and your sugar shoots way down at night, they’ll wake you up and go get you juice. If you have seizures, once you’ve bonded with them, they may even be able to alert you up to 30 minutes beforehand that a seizure is coming on, which is huge in the prevention of falls. 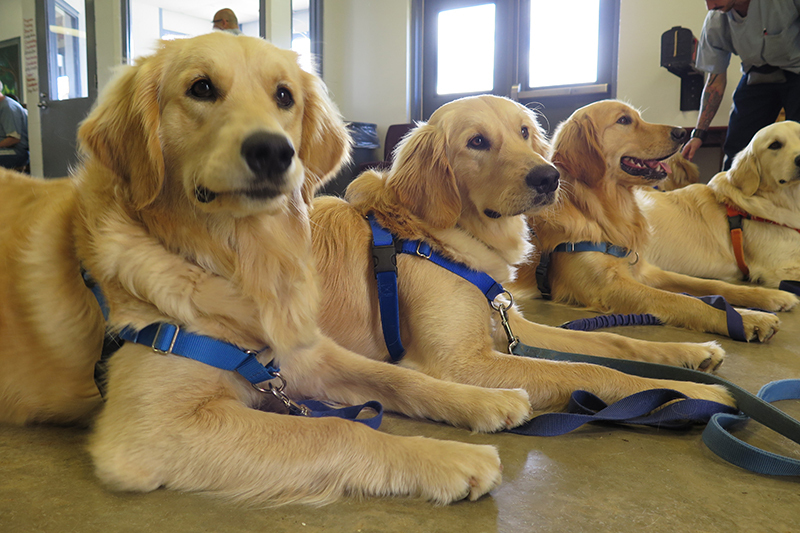 Each dog gets very specific training, personalized to the eventual owner. Diabetic recipients provide samples of their blood so the dog can get used to detecting the smell of high or low blood sugar. RI will also put a piece of the recipient’s clothing in the dog’s crate for several months so they’ll know their owner’s smell before they ever go to live with them. Most importantly, though, they never let a person choose a dog without a dog choosing the person, too. Fostering the psychological harmony of all the program’s participants is crucial to its success. 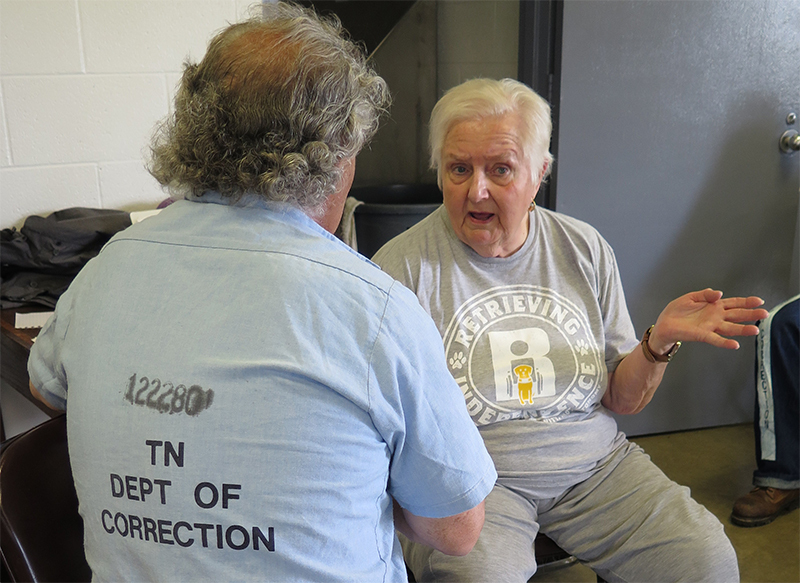 As a retired therapy professor and family therapist, Dew’s decades of experience show during every inmate training session. She has them keep journals, which only she reads. She teaches them a monthly class on communication and leads discussions on how to tell right from wrong. Over time, the men feel comfortable opening up to “Ms. Brenda,” and that, she believes, leads to better emotional and mental health. She’s only gotten anecdotal evidence so far, but she’s hoping the prison will allow her to do further testing in order to prove rehabilitation is occurring. They must have at least two more years to serve on their sentence so they can complete a full training cycle. Two men are assigned to a cell with one dog, so if one person is having a bad day, the other can take over. “Because they do it in teams, it becomes a building block to help them connect with each other,” says Dew. Dew’s personal history with pet therapy is long and lauded. 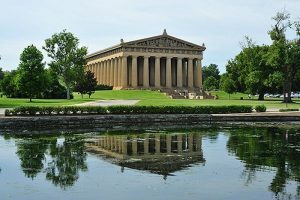 In 2006, she and her dog, Daisy, were awarded the Frist Humanitarian Award for the hours they volunteered at Parthenon Pavilion psychological hospital. Daisy did a 10.5-year tour of duty at Parthenon before retiring last November, and Dew has done 12 years total with Daisy and two other dogs. Growing up in North Carolina, Dew loved ponies and puppies. She also loved learning, and knew she wanted to see the world, though she had no idea how to make that happen. Dew ping-ponged all over the world: Germany, The Philippines, Korea, England and Goose Bay in Labrador, Canada. 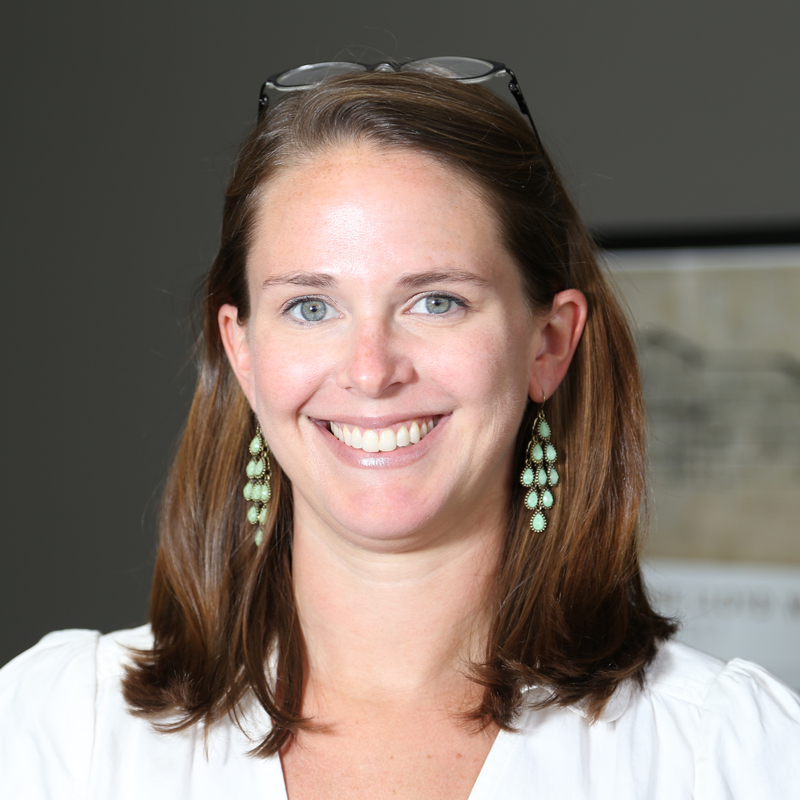 She was one of just 30 people out of 2,000 who were offered a free master’s degree in counseling for teaching overseas through Ohio University, and she eventually earned her doctorate in counseling as well. She taught at a military prison for a time, never knowing that experience might come back into play so much later in life. 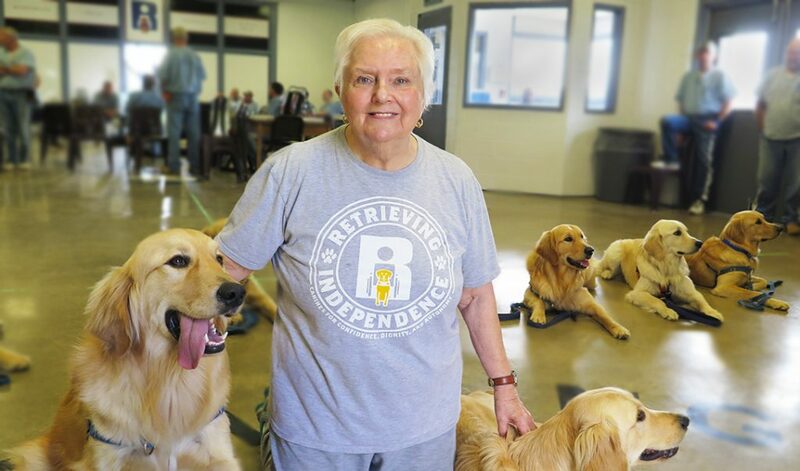 After teaching stints at Slippery Rock University (Pennsylvania), Vanderbilt University (Tennessee) and Lindsey Wilson College (Kentucky), she retired in 2012 and continued doing pet therapy at local hospitals. She wanted to learn how to train dogs for service but didn’t know where to start. One day, as she sat outside a Weight Watchers meeting with her therapy dog, Daisy, a girl walked in and asked if she was a service dog. So once Dew deems a dog is ready to graduate, what happens next? Dew has dozens of stories about the people RI dogs have helped, and many illustrate how the dogs often change a caregiver’s life as much as a recipient’s. If someone in your family has an ongoing illness, their life is limited, but so is yours, physically and mentally. Ronnie Betnar is one of those caregivers. At work, all day every day, Ronnie worried. His wife, Karen, has extremely hard-to-control type 1 diabetes and experiences frequent, life-threatening swings in blood sugar. If Ronnie couldn’t get Karen on the phone, he assumed the worst: she’d had a seizure, which left her injured or unable to call for help — or worse. His worry was justified: Karen has had seizures so extreme while sleeping that she’s broken her leg from falling out of bed. 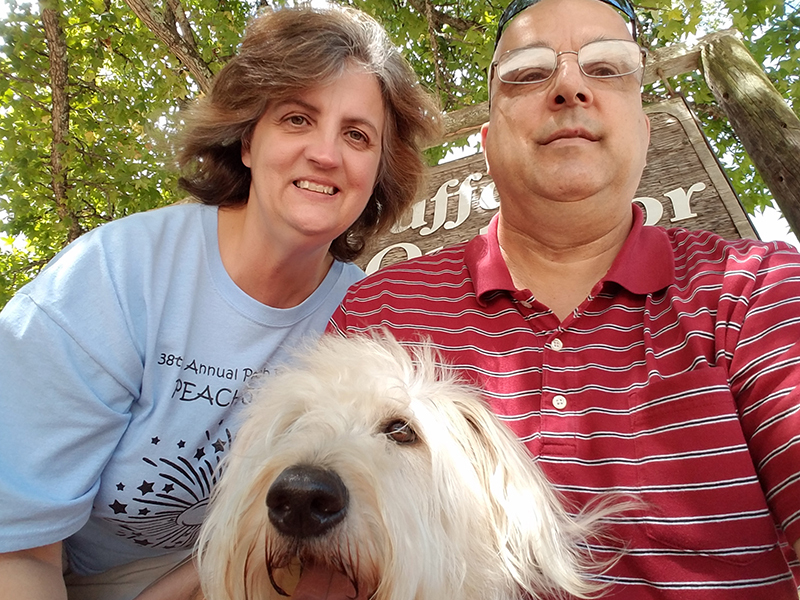 But last April, all of that changed thanks to a two-year-old labradoodle name Minnie. “A month after we got Minnie home, Karen called me and said Minnie had just woken her up because her sugar was low; she’d gotten to her before the seizure happened,” he recalls, choking up at the memory of the gratitude and relief that washed over him. The mental aspect of the program is something the Betnar’s hadn’t counted on. Karen has more freedom than she’s had since she was diagnosed at 20 years old, and she can go almost anywhere with Minnie. “If we go the grocery story and my sugar is getting out of range, she’ll bump me with her nose and spin in circles. Sometimes if we’re somewhere she knows she’s supposed to be quiet like church, she’ll just stare me down, which she just came up with on her own!” Karen says. The ability for these dogs to connect people to each other is a heartwarming byproduct that no one expected at the beginning. After receiving Minnie, Karen and Ronnie went back to the next graduation because they were so inspired by the inmates and their stories. “It is just so touching to see these men shine,” Karen says. For Karen’s actual family, though, Minnie continues to change their lives every day for the better. Centennial Park is a wonderful place for dogs to practice their manners. There are always different kinds of dogs walking, birds, squirrels, ducks, geese, bicycles and people running and walking. It’s a great place to socialize, for dogs and for people. 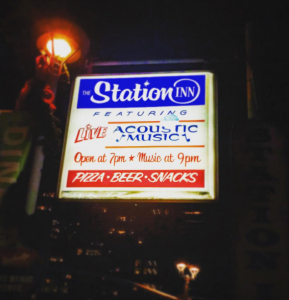 It’s a great dive where I’ve seen many soon-to-be country stars perform. 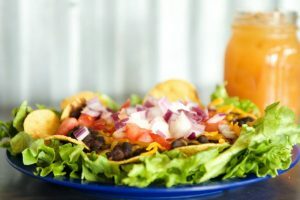 My go-to is always the black bean salad. Why do you breed your dogs rather than training rescues? It’s imperative to know the dog’s lineage. 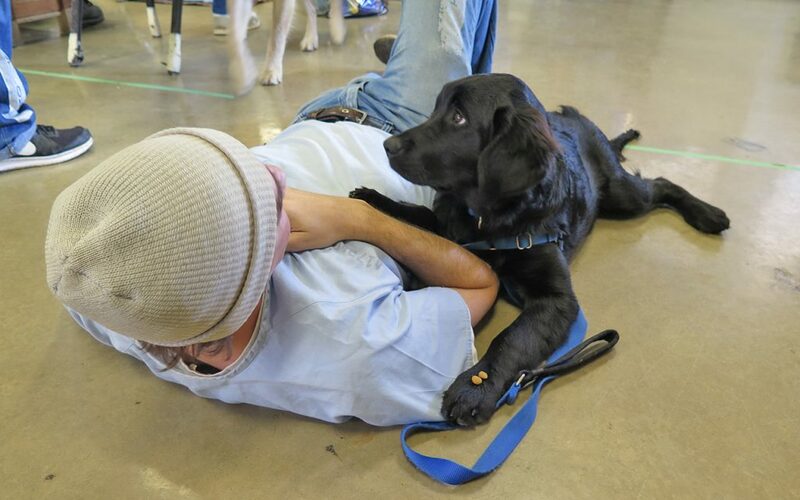 If there are any hereditary problems — from aggression to hip problems — that could impact their ability to be reliable, safe service dogs, trainers need to know about it. Golden retrievers, labradors and mixes of the two have proven to be good for service, so we breed those. There are organizations like Borderland that help people train their own dogs for diabetic alert, and shelter dogs are welcome. 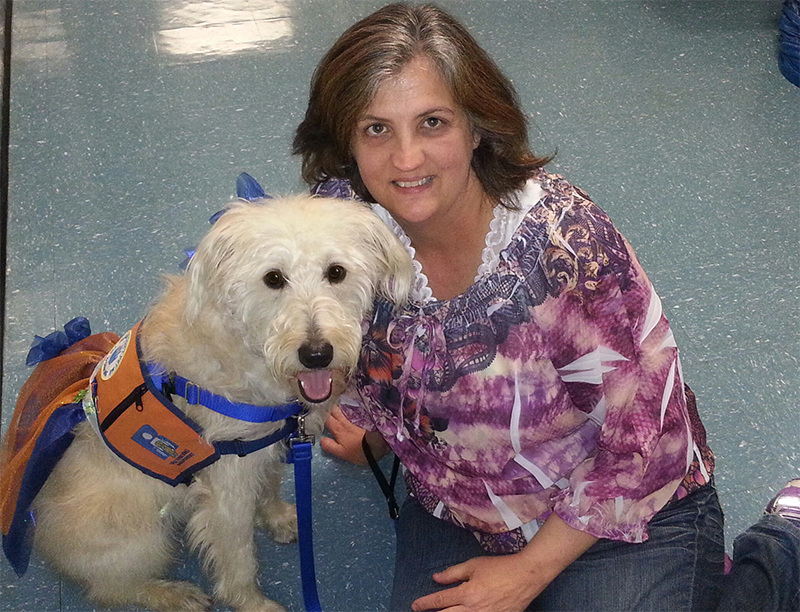 I am also an evaluator for pet therapy through Therapy ARC. After taking a course, if your pet passes, he/she can be classified a pet therapy dog. What exactly does a pet therapy animal do? 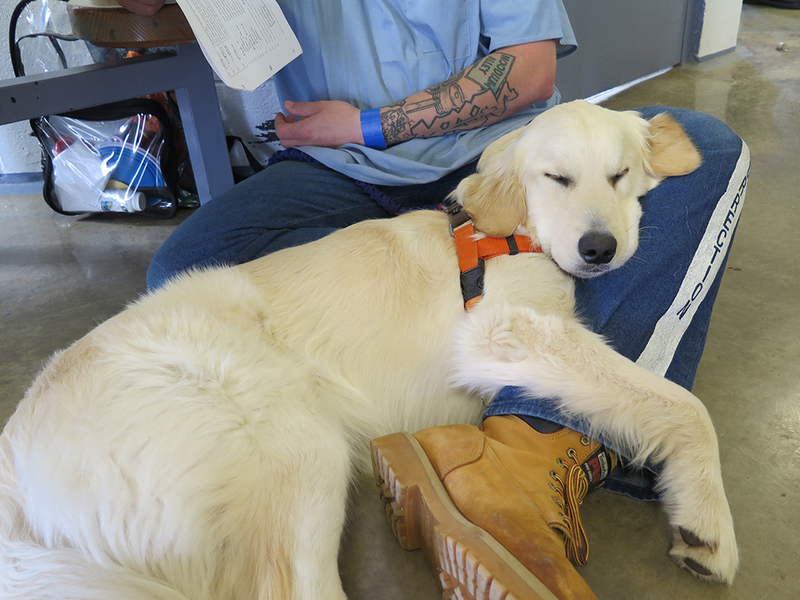 Pet therapy dogs are totally different from service dogs, and much less highly trained. $15,000. We’d like to give them away, but obviously it takes a lot of work to train these dogs, and we’re nonprofit. Unfortunately insurance does not cover service dogs like these, but I wish it did. The prison also pays the men $0.59/hour. 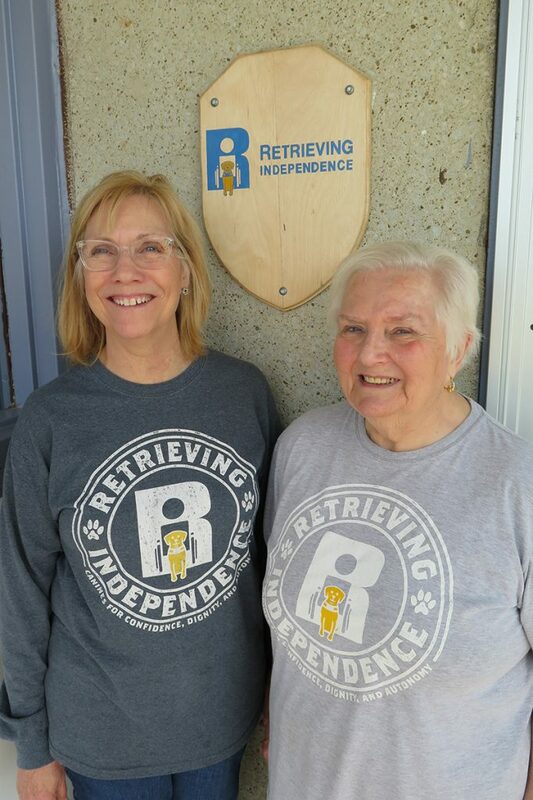 What does the transition process look like once a dog is matched with a recipient and caregiver? 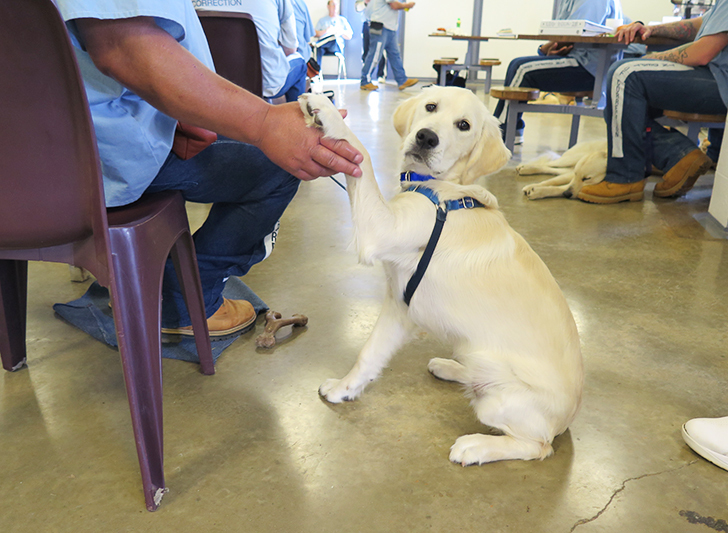 The recipient and caregiver both visit the dogs in prison, so they know their trainers, and they come to graduation. After graduation, they complete a 10-day training course where they stay in a hotel with the dogs. After six months, they bring the dogs back in to assess how everything is working; If it’s not going well, we’ll try to match them with a different dog. If it is going well, after a year, the dog becomes theirs. I hear you mention graduation a lot. What’s so special about it for you? Graduation is really the pivotal point for everyone; it’s probably one of the most powerful things I’ve ever been to. My friends in the Symphony come play, and one time we had a bluegrass band. These days, we also do a dog drill team, which is so fun. It came out of the fact that I was having difficulty getting the men to work together, so I said, ‘OK then, you’re in charge of choreographing a performance — you can either work together and make it good or we’ll all look like idiots together!’ And that got them. But the most important part is the inmates and the recipients getting up to share their stories. This year, Ronnie Betnar shared how much having Minnie has changed their lives. I remember he said he no longer wakes up in the middle of night to check and see if Karen is still breathing. Being able to give someone that kind of peace of mind, there’s just nothing else like it in the world.